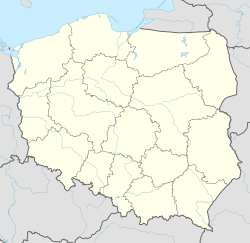 Kołbacz [ˈkɔwbat͡ʂ] (German: Kolbatz) is a village in the administrative district of Gmina Stare Czarnowo, within Gryfino County, West Pomeranian Voivodeship, in north-western Poland. It lies approximately 4 kilometres (2 mi) north-east of Stare Czarnowo, 23 km (14 mi) east of Gryfino, and 20 km (12 mi) south-east of the regional capital Szczecin. It is located on the Pyrzyce-Stargard Plains, on the west bank of the river Płonia, and has roughly 1400 inhabitants. The area has been inhabited since at least the times of the Lusatian culture. In 1173 it was donated to the Cistercian order (originally of Denmark). Between 1210 and 1347 a large monastery (Kołbacz Abbey) and several farms were built in the area to house the monks. In sources known as Colbatz, Kolbatz, Colbas, sometimes Mera Vallis which means Bright Valley. After the secularization of Pomeranian Cistercians in 1555 the area became a private property of the Dukes of Pomerania-Stettin, the monastery was converted into a castle and then into a summer residence of the dukes. The rulings of the Peace of Westphalia (1648) and the Treaty of Stettin (1653) assigned Kolbatz to Brandenburg, which later became part of the Kingdom of Prussia. Since 1815 it was within the Province of Pomerania. After 1945, it became part of Poland. Among the most notable historical attractions are remnants of Cistercian abbey, which include a Romanesque-Gothic church (1210–1347), one of the oldest brick churches in Pomerania. There are also remnants of the monastery itself, as well as a converts' house, abbot's house, a gothic barn and a fortified tower. This page was last edited on 12 December 2017, at 17:11 (UTC).